DA Form 5328 - also known as the "Bona Fide Dependent Declaration (civilian)" - is a Military form issued and used by the United States Department of the Army. The form - often mistakenly referred to as the DD form 5328 - was last revised on February 1, 2009. Download an up-to-date fillable PDF version of the DA 5328 below or request a copy through the chain of command. 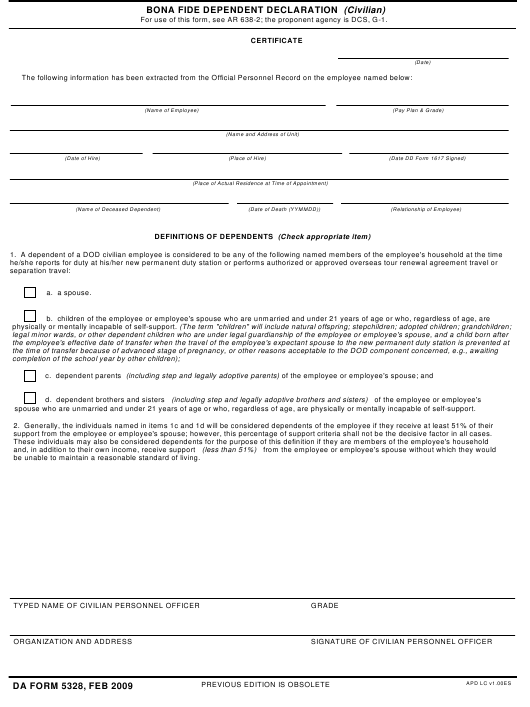 For use of this form, see AR 638-2; the proponent agency is DCS, G-1. spouse who are unmarried and under 21 years of age or who, regardless of age, are physically or mentally incapable of self-support. support from the employee or employee's spouse; however, this percentage of support criteria shall not be the decisive factor in all cases. be unable to maintain a reasonable standard of living.